Many low molecular weight drugs, like classical surfactants, contain both hydrophobic and hydrophilic groups. However, due to their lower molecular weight and less distinct separation into hydrophobic and hydrophilic regions, the self-assembly of such drugs in aqueous solutions is less easy to describe in general terms. To gain more understanding of the interaction between such amphiphilic drugs with phospholipid membranes, the present study was focused on one specific drug molecule, propofol, which is predominantly hydrophobic but contains a hydrophilic OH-group located in the middle of the molecule. Propofol is currently one of the most commonly used general anaesthetic molecules in clinics today. A molecular picture of the interaction between the anaesthetic drug and model neurons would support development of new drug delivery systems; and provide understanding of how an anaesthetizing agent is distributed within a neuronal membrane. Combining Neutron Reflectivity with Vibrational Sum Frequency Spectroscopy gave us the unique opportunity of studying the interaction between model membrane and propofol at a level of detail that was not possible before. We were able to investigate not only the order and disorder within the phospholipid layer during the interaction with anaesthetizing drug propofol, but also the location of the propofol on the z direction, enabling us to learn how dip propofol can penetrate the model membrane. As schematically illustrated in the picture below, our data show that propofol is located in the phospholipid headgroup region at low surface pressures, but it is squeezed out of the monolayer as the phospholipid molecules pack closer together with increasing surface pressure within the lipid monolayer. We have demonstrated that propofol has the ability to increase the fluidity of the phospholipid monolayers, and this was enhanced for phospholipid monolayers possessing more disordered tails. This work was conducted by Petru Niga from Surface, Process and Formulation unit at RISE – Research Institutes of Sweden together with Magnus Johnson and Per Claesson from KTH - Royal Institute of Technology in close collaboration with Richard Campbell at University of Manchester, UK and Patrick Gane and Joachim Schoelkopf from Omya International AG, Switzerland. To extend the scope of our study, we plan to learn more about the interaction of propofol with different types of phospholipids. The reason is that these phospholipids are known to phase separate into well-ordered and disordered domains in biological membranes. Such studies are crucial to understand the effect of propofol in the human body and will shed light on how the lateral structure of the membrane is affected by propofol. 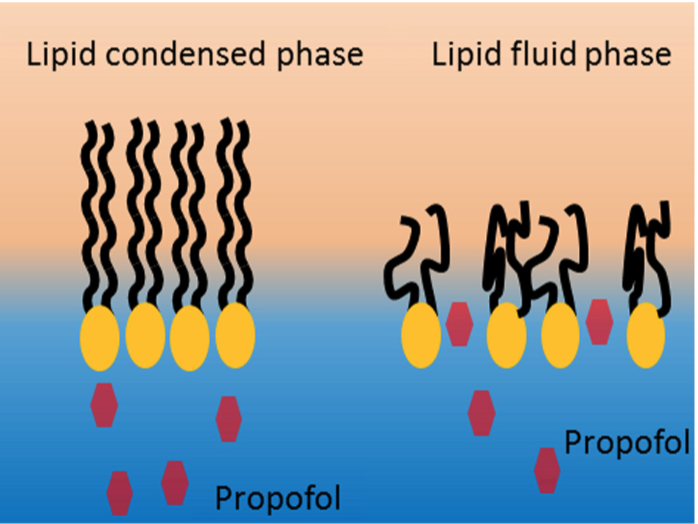 Knowledge of the location of propofol with respect to different types of lipid membranes will provide us with a better understanding of the interactions, which in turn will enable the development of improved drug delivery efficiency.